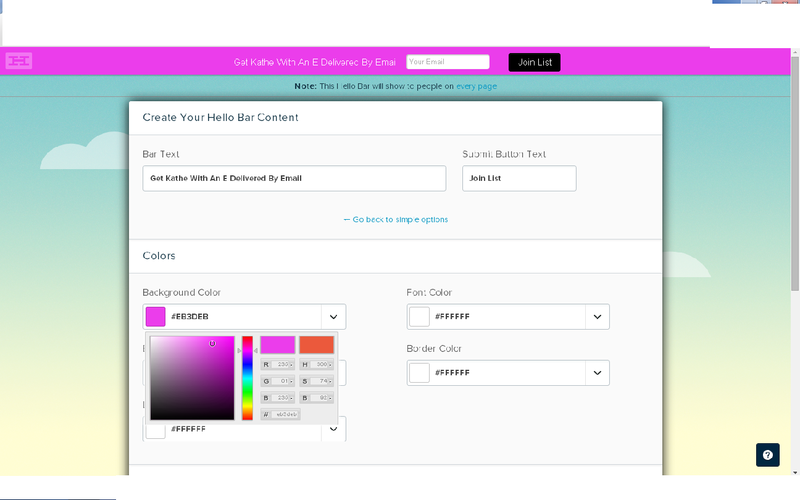 At the top of my blog, you will see in a very fluorescent pink, what is known as a Hello Bar. 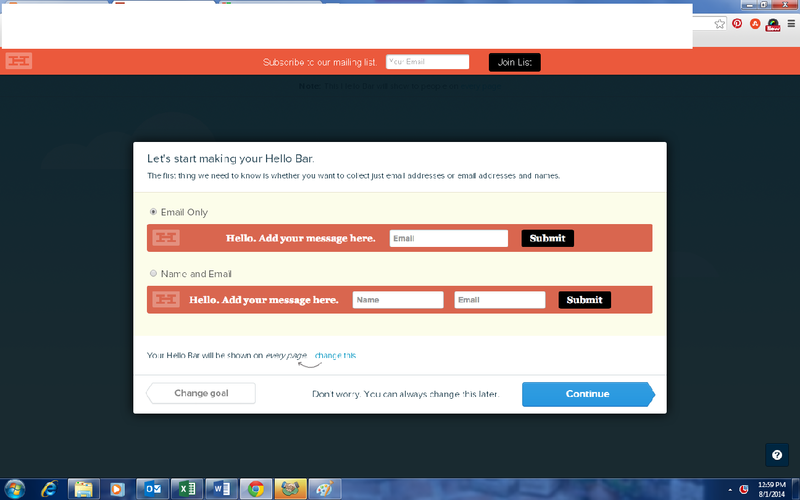 I have been asked numerous times about it, what is it, what does it do, so, I thought I would share a simple tutorial with you on how to install and use the Hello Bar on Blogger. 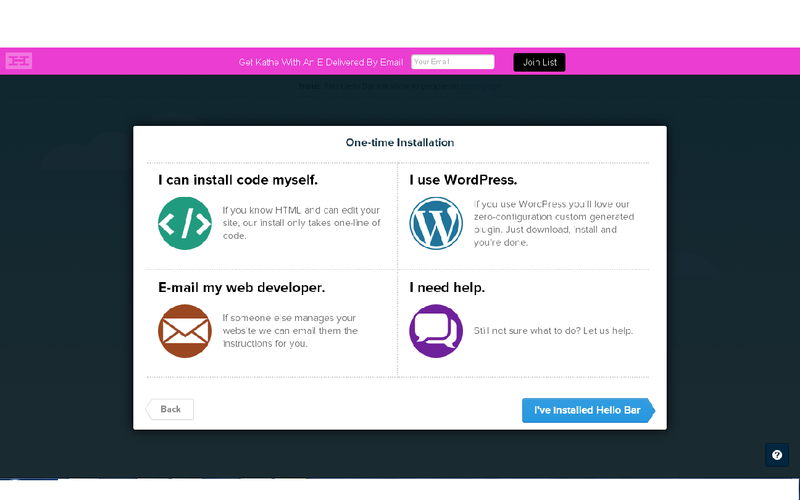 The Hello Bar is a free optimization tool that allows you to show the right message at the right time to your website visitors. You can set the Hello Bar to guide readers to sign up to your email list, follow/ like you on any of your social media, sell an ebook, or even take them to your etsy shop. From my own personal experience, I can tell you it does work! My email list grew by an average of 3 new signups per day last month. And, I didn't have to do anything! The Hello Bar did it all for me! Now, let's get you started in setting up the Hello Bar on your Blogger blog. First, Click here to be taken to the website and create an account. Now, you have to decide where/ what it is you want to direct your readers to. If you are selling a product or have a specific website you want your readers to go to, choose Drive Traffic. If you want to collect email addresses, choose Collect Email. And the last option, Collect & Share is to lead your readers to like/ follow you on any of your social media outlets. For this tutorial, we are going to choose Collect Email. I always choose Email Only but you can choose Name and Email. Totally up to you. Once you decide, click Continue. Next we want to fill in the Bar Text line. You can leave it with the default text but why not make it a bit more personal? Note: You can also change your link URL by clicking on Edit Link URL. 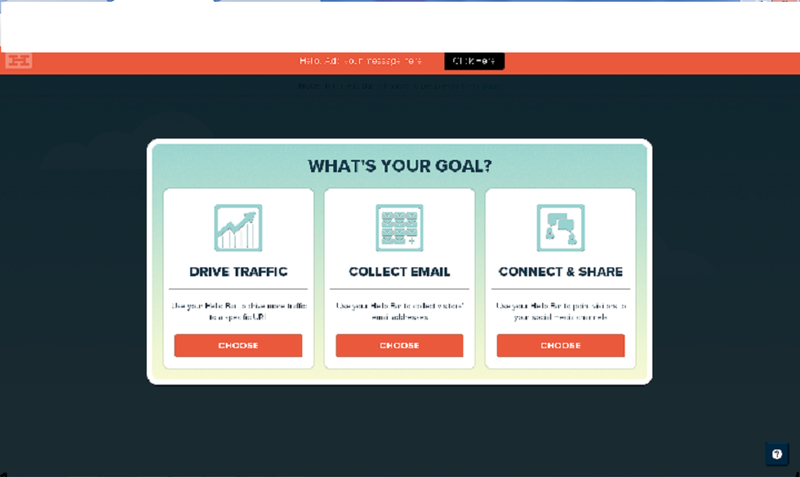 You can find your Mailchimp signup URL by going to Lists, Create Forms and you should see it there. **For Feedburner, we kind of have to back up because, for it to work you have to use the Drive Traffic option when you first log in. Log into Feedburner, go to Publicize, then on the left, Email Subscriptions. Scroll down to the subscription link code. Find the part in the link code that comes after the a href=. You will copy just the URL in the quotes there. That is your subscription link. Now, we want to choose the color of our bar. You can go with one of the 5 standard default colors, or you can choose "Customize look and feel..." and go crazy! I have heard from other bloggers that the more wild the color, the better the result. You know me...I always error on the wild side! Under "Background Color" I went for the hottest pink I could get. 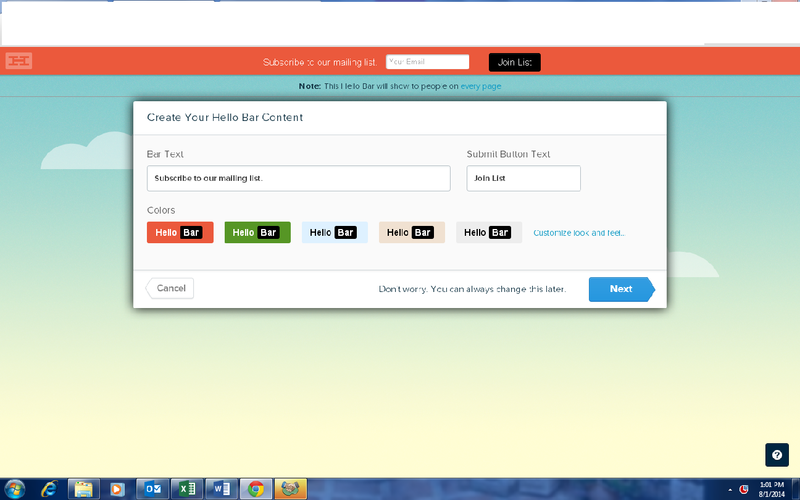 Time to add the code to our blogger template. In some cases, in order to make sure the Hello Bar is on your blog you may have to clear your browsing history and then go check your blog. There you have it! The new way to capture new readers aka friends! I like to change up my Hello Bar at the first of each month. One month will be email subscribers, the next month might be Follow Me On Facebook. Once you know how to set it up, it's a no brainer to change it up! **Disclaimer: Results may vary. Always back up your Template before attempting any changes. Always consult a professional if you feel overwhelmed by any of the tutorial steps listed. What works for me, may not always work for you. Kathe With An E assumes no responsibility if installation process is not followed correctly. I've wondered how to do a hello bar. Love these easy directions! Thanks for the information...Now I just need to install it. Great tutorial Kathe! I've been thinking about installing a Hello bar and now I know how simple it is. Thanks! Thanks for the great tutorial Kathe. I have been wanting to add this to my blog and now I can. Thanks so much for the info! I may be able to try this - hopefully! Pinning to my Blog Help board. I have been thinking on installing this....I think you may have convinced me! When I click Ctrl F nothing happens! Can you help me with what I am doing wrong? I got it installed! Very simple! My question now is, where do the emails collected go? Do they become email subscribers through my feed burner? Thanks for this great tutorial Kathe! I was able to install the hello bar with no problems! This just made my day!! Thank you so much!!!! You were super helpful!! Hooray for getting it to work!! Thanks for the tutorial! I couldn't figure it out and this was perfect! Thanks Kathe, this was very helpful! thank you for this tutorial! I just installed mine. Your directions made installing a Hello Bar sooo easy! Thanks for sharing. Fabulous Kathe!! Thank you, thank you, thank you!! :) Off to pin!! 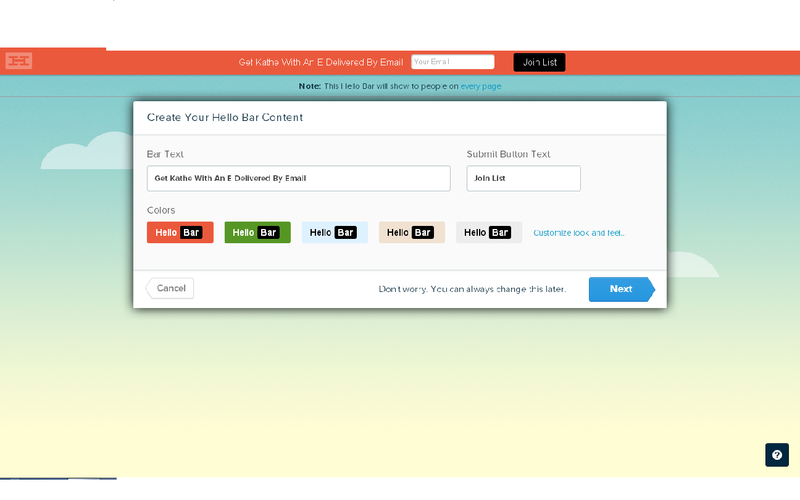 i copy and paste the code on my blogger, but did not show hellobar on my site.